Rose' World: Wayang or Nanyang? We had our late breakfast in this food court last Saturday. This round we seated inside the food court. And I noticed the beautiful wall picture above the cashier counter. The picture depicted the old street in the old Chinese bazaar. Very lovely painting I thought. However I could not remember of a Nanyang street but we do have a Wayang Street where the famous Hong San Si temple is situated. 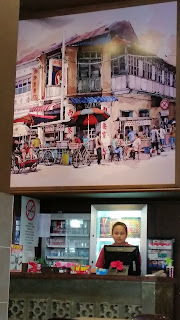 So whether it is Wayang or Nanyang, I like the wall poster of this food court. And that morning for our breakfast we have the much celebrated Kuching food. KOLO MEE! 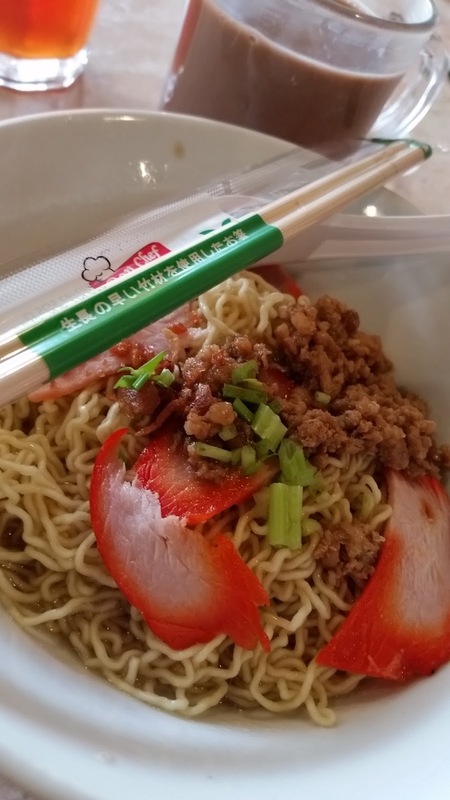 I have been here few times before but never tried the kolo mee stall. 1st time I wanted to tapau but it finished up just before noon. The last 2 visits, no one thinking of having kolo mee at all as too many other choices available. 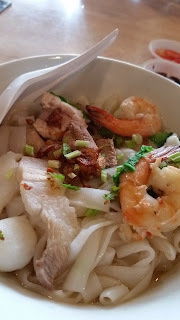 So in this visit, hubby and kids had kolo mee with char siew while I tried its seafood kuaw tiaw. Got "kung fu" we commented on the stall operator. Very well cooked and tasty. Everyone enjoyed their noodles. And hubby also ordered a bowl of fish and meat balls soup. So plus 4 bowls of noodles, our meal costs RM19.60. We enjoyed the noodles very much. Delighted that we found a hidden gem in this food court. Another satisfying food experience here. Ya...I know Wayang too. There's a popular cendol place stall there, Ah Yong. Never tried though. I'm sticking to Swee Kang. So so so nice! 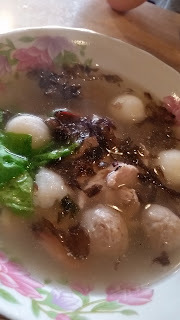 I see soupy kuey teow.. My kids love it.. Yummzzz.. I am so going to eat Kolo Mee and Sarawak Laksa when I got to Sarawak next! Looks pretty good. I would love the soup and the seafood kuey teow. I remember eating that in Kuching. I'll be wanting that more than kolo mee right about now. The wall picture is really big! Gives one a nostalgia feeling looking at it.